In a first for the professional South African cricketing landscape, the Sunfoil Dolphins and Hollywoodbets have signed a ground-breaking associate sponsorship deal ahead of the upcoming 2015/16 domestic cricket season. Adding further momentum to the winds of change currently sweeping through KZN Cricket, the three year deal will further strengthen the financial position of the regional union and the Sunfoil Dolphins franchise as they prepare for a competitive 2015/16 season. 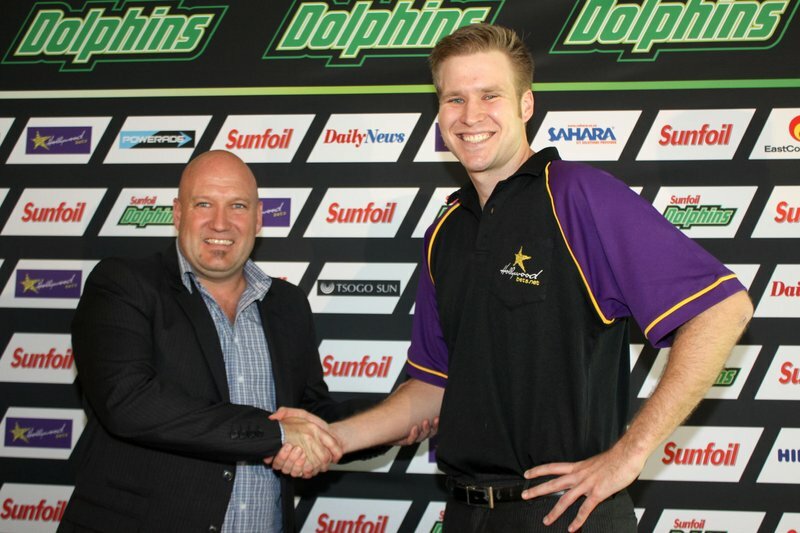 “We’re extremely excited by our new partnership with the Sunfoil Dolphins as we look to further our involvement with the game of cricket in the province,” said Hollywoodbets Media and Communications Executive, Devin Heffer. First started at premises in Sandile Thusi (Argyle) Road in 2000 before opening their current flagship Hollywood Park in Springfield Park a few kilometers away, the bookmaking and sports betting business is excited to offer new added value experiences to followers of cricket in KwaZulu-Natal. “Hollywoodbets is a proudly South African, KZN and Durban brand and, fuelled by an unfaltering passion to succeed, we aspire to be innovative and redefine the market trend. “We are therefore delighted to be involved in this ground-breaking deal and are excited by the synergy that exists between our motivation and what the Sunfoil Dolphins aim to become in the not too distant future,” said Heffer. Hollywoodbets is also passionate about contributing to the adherence of the strict guidelines that govern the sports betting industry and cricketing fraternity in South Africa. “We are confident that the strict enforcement of rules designed to protect and safeguard the game of cricket in South Africa will see this relationship between us and one of South Africa’s top cricket franchises become a hugely positive and mutually beneficial alliance,” added Heffer. As title sponsors of 2014/15 National Club Champs winners Crusaders Cricket Club and owners of the award winning Hollywoodbets Bunny Bar at Sahara Stadium Kingsmead, one of the most popular food outlets amongst fans on match days, Hollywoodbets is already a familiar name within KZN cricket circles. “We are thrilled to welcome Hollywoodbets to our Sunfoil Dolphins family,” said Sunfoil Dolphins CEO Pete de Wet. “There has been a long standing relationship between Hollywoodbets and cricket in KwaZulu-Natal and we look forward to being able to take this association to the next level thanks to this innovative associate sponsorship deal. “Sponsorship is a vital component in our ability to ensure that our team is adequately equipped to succeed on the field. “Along with the passionate support we get from our title sponsor Sunfoil as well as all the positive change currently happening here at Sahara Stadium Kingsmead, this relationship with Hollywoodbets means that as we embark on a new season, I am confident that the Sunfoil Dolphins will be a major force to be reckoned with.